Marty Bailey follows Gil McCormick up the east ridge of Quandary Peak. SUMMIT COUNTY — To Scott Smiley, Colorado mountains are the crunching of snow underneath his shoes, the scent of pine needles, the chirping of birds and the feel of fresh, alpine air on his skin. Because the military veteran and instructor is blind, what he won’t see is the whiteness of snow or the sight of towering peaks, until guide Eric Alexander paints a mental image of the rugged mountains. Smiley and fellow veteran Marty Bailey both fought for the U.S. Army in Iraq, where they lost their sight — Smiley to a car bomb and Bailey to a grenade explosion. But being blind hasn’t dampened their sense of adventure. 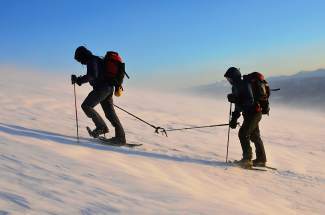 The two were in Colorado in mid-March to train for a May trip up Alaska’s Denali mountain (Mount McKinley) — North America’s tallest peak. Joined by Vail Valley resident and mountaineer Eric Alexander, the two got some altitude training in Summit and neighboring Park County by climbing Quandary Peak and Mount Lincoln — two of the state’s above 14,000 foot peaks. Bailey and Smiley hope to make the first blind ascent of Denali’s West Rib, a more technically challenging and direct route than the more trodden route that climbs 9,000 feet to the summit. They’ll do so with the help of Alexander, who has summited peaks around the world, notably guiding his friend Erik Weihenmayer to become the first blind person to summit Everest. Along with a support team, the three did some ice climbing on Lincoln, where a snowstorm unleashed on the group during the excursion. The following day, they climbed Quandary, a 14,000-foot peak, battling 40-mph gusts of wind above tree line. Besides acclimation, they worked on the system they’d use to find their footing. When ice climbing, it was a challenge for climbers without site to keep their ice axes and tools from tangling up in ropes. Even on a straightforward hike, changing conditions and uneven terrain pose difficulties for a blind person. The two soldiers relied instead on listening to the footsteps in front of them, hearing cues shouted out by Alexander, following the ringing of a bell and sometimes even following a fixed rope or grabbing the ski pole of the person in front of them. Smiley, 33, has climbed Colorado peaks before as well as Mount Ranier, but Denali will be his biggest endeavor yet. Both Smiley and Bailey want to continue to live healthy lifestyles and make the most of what their bodies can do. Yeah, climbing without sight is a big deal, but it’s the climbing experience itself that the two are training for. The ultimate goal of the adventure, however, is to raise awareness for the two soldiers’ belief that life doesn’t have to end after such an accident. They also hope to lobby for research dollars into technology that could someday restore some sight for people like Smiley and Bailey. Developing technology in China and Australia could create prosthetic retinas. Digital technology could hardwire images from a camera into a person’s brain. Congress just needs to put money toward this kind of research, Smiley said. Both hold out for hope that some of their sight might be restored during their lifetimes.